Plein airbrush is an experimental gesture that puts the romantic ideals of painting up against contemporary dependence on technology. 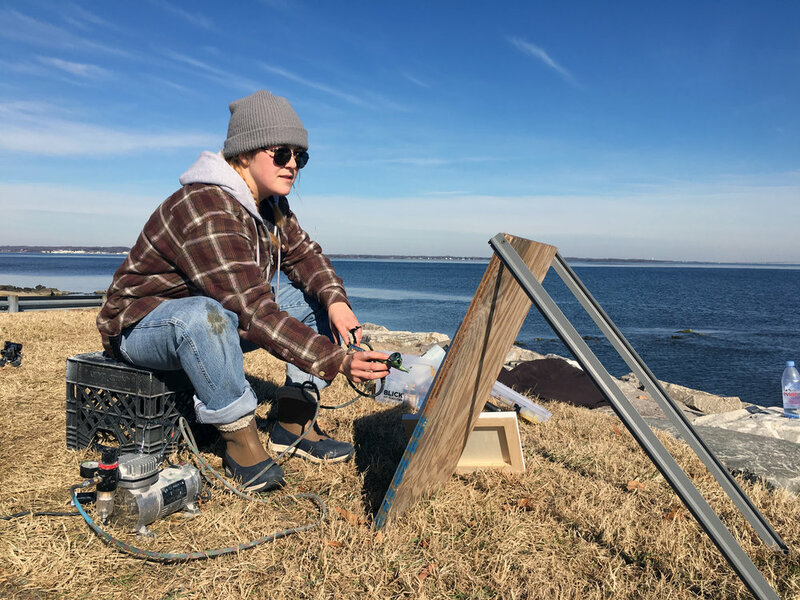 In this work, I drag my airbrush kit (complete with compressor, paints, cleaning solution, paper towels, easel, mediums, jars) along with a Generic QP 5500 gasoline generator out to Tolly Point on the Chesapeake Bay. The reverent quiet I would expect from a plan air experience is disrupted by the growl of the generator working hard to put out electricity. The wind kicking up from the shore disturbs the space between my airbrush and canvas; tossing the stream of atomized paint around unpredictably. By attempting to render the tranquility of Tolly Point I effectively ruin it; overshadowing the lapping waves and gulls with the howls of machines working together to push a .355 mm stream of paint through a tube.